Catalan pro- and anti-independence supporters confronted one another on Monday in Canet de Mar (Barcelona) over yellow crosses that had been driven into the sand at the local beach to honor jailed separatist politicians. Three people sustained minor injuries as a result of the scuffle at the beach, where members of a grassroots group called Committees to Defend the Republic (CDR) had planted dozens of yellow crosses representing the separatist politicians who are in pre-trial detention over their role in the unilateral independence push last year. 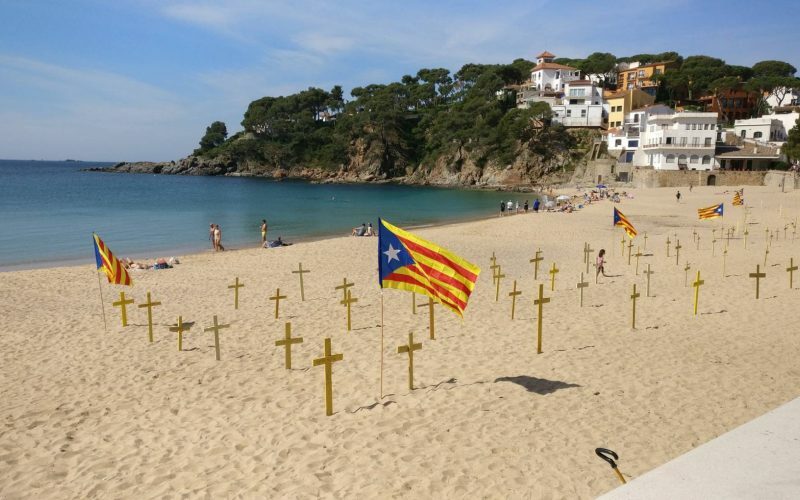 Pro-independence activists have been putting up yellow crosses at several beaches across Catalonia, including Cadaqués and Llafranc, where angry verbal exchanges between supporters and detractors of independence have been reported. In Canet, a group of around 20 people pulled out the crosses to jeers from separatist supporters, who tried to stop them and made recordings of the incident. The regional police force, the Mossos d’Esquadra, reported three people as slightly injured, including Marc Jiménez, a councilor for the far-left, pro-independence CUP party. In statements to the Catalan radio station Rac1, Jiménez said that a woman received a blow to the head when she tried to pull a balaclava off one of the individuals taking out out the crosses. He also said that an elderly man was hit in the neck and started to bleed, and that he himself was kicked while a man pinned him down with a cross. Meanwhile, a radical separatist group called Arran shared a video in which three hooded activists dressed in black burned three large photographs of Spanish Prime Minister Mariano Rajoy, Socialist Party leader Pedro Sánchez and Ciudadanos head Albert Rivera in front of the Barcelona headquarters of the Popular Party (PP). The video ends with the slogan “Tombem el 155, tombem el règim” (Let’s take down 155, let’s take down the regime), alluding to Article 155 of the Spanish Constitution, which revoked Catalonia’s powers of self-rule right after the unilateral declaration of independence by the Catalan parliament in late October. The event took place in the middle of the night and the regional police said that the PP headquarters did not sustain any damage. But PP spokespeople said the act was meant to burn down its premises and warned about “the serious consequences” it might have had on the neighbourhood.